Home / #Health / Health / #Health : On Psoriasis:disorder What is the Koebner phenomenon? #Health : On Psoriasis:disorder What is the Koebner phenomenon? Psoriasis is a common skin disorder that causes the skin to go through its life cycle more quickly than usual. The development of psoriasis patches near a skin injury is known as the Koebner phenomenon. During a rapid skin cycle, the dying skin cells build up into often red, scaly patches that can be itchy and painful. Often, the patches develop on the trunk and around the joints. For some people with psoriasis, patches may form in an area where there has been an injury. These lesions usually appear within 10 to 20 days but may take as long as 2 to 3 years to develop fully. The Koebner phenomenon is a condition that causes lesions to appear near skin injuries. There is no way to prevent the Koebner phenomenon entirely. It is differentiated according to the severity and presentation of the lesions. It may present differently in different people. The Koebner phenomenon is often associated with skin disorders, such as psoriasis. However, individuals who do not have skin problems may also develop Koebner phenomenon. A Koebner phenomenon that develops due to one type of injury, such as a cut, is likely to appear as a result of another kind of injury, such as a burn or bite. On the other hand, if a person does not develop a Koebner response from an injury, it is unlikely that it will occur after a different type of injury. 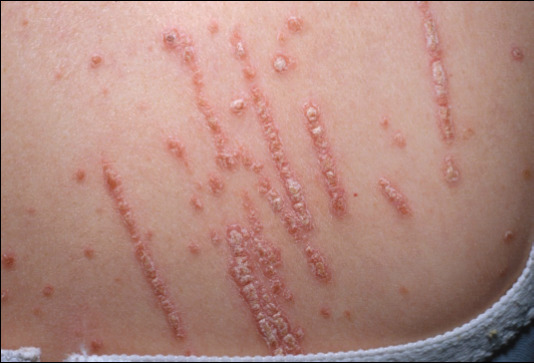 In people with psoriasis, Koebner phenomenon causes psoriasis patches or irritation to develop on or around the injured area. The patches will often be linear or follow the shape of the injury itself in the case of a cut, blister, or insect bite. Despite knowing about the phenomenon for well over a century, doctors are still not sure exactly what causes it. What they do know is that the skin is overreacting to a stimulus. Some researchers have theories about what causes Koebner phenomenon. For example, some researchers suggest that both layers of skin (the epidermis and dermis) need to be injured at the same time. Another theory suggests that the inflammatory responses to the injury may trigger psoriasis to develop. Additionally, the Koebner phenomenon occurs more frequently in people who were diagnosed with psoriasis when they were very young. Interestingly, people rarely report the phenomenon after they have had a vaccine or a tattoo. What is the link to psoriasis? Psoriasis and other skin disorders are associated with higher instances of the Koebner phenomenon. When psoriasis is present, the lesions that appear with Koebner will look and feel like the other psoriasis patches. Not all people who have psoriasis will develop Koebner phenomenon. Koebner phenomenon and psoriasis are distinct conditions. Koebner phenomenon can occur alongside other skin disorders or on its own. However, because psoriasis is a widely studied disease, Koebner phenomenon is often studied in people who have psoriasis. People with psoriasis who experience Koebner phenomenon will likely develop psoriasis patches around wounds. Often, it will take several days for the new patches to appear, but they may take a few years to form.